Description of the words. Sharing with your family and friends words and phrases like: Behold the Lamb of God, who takes away the sin of the world. John 1:29. For I know the plans I have for you,” declares the LORD, “plans to prosper you and not to harm you, plans to give you hope and a future. 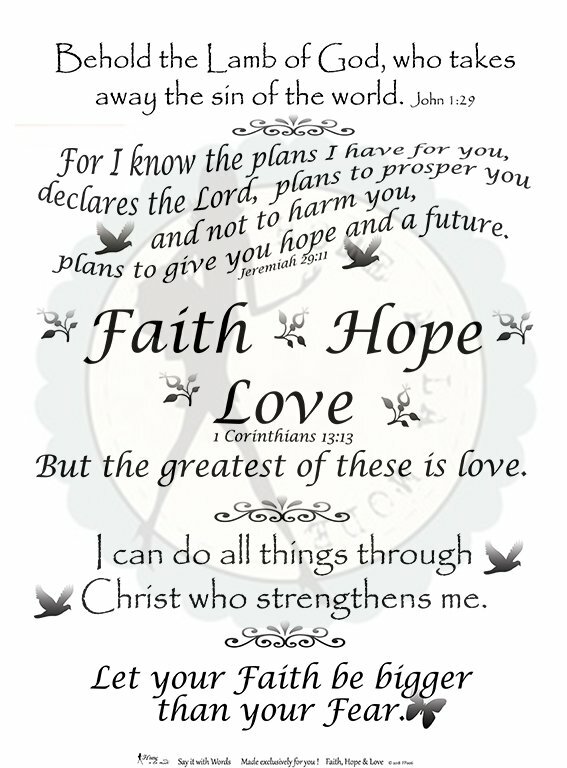 Jeremiah 29:11 Faith Hope Love 1 Corinthians 13:13, But the greatest of these is love. I can do all things through Christ who strengthens me. Let your Faith be bigger than your Fear. Basic Instructions: 1/ Press. 2/ Cut strip off, cutting vertically down right side. 3/ Add borders, blocks or anything on outer area… or just use as a wall hanging or a pillow.